One of the most notable new additions to iOS 5 was the inclusion of Notification Center. One central place on iOS powered devices which allows you to always know what’s up and what went down by displaying emails, texts, calendar events, app notifications, breaking news, latest scores and whatever else may tickle your fancy. With one powerful swipe of your finger, you can be the master of your notification universe by displaying the new Notification Center. The development and inclusion of Notification Center in iOS 5 exists purely to solve a problem. Alerts and Notifications in previous versions of the operating system were handled by ugly, obtrusive UIAlertView’s which offered a terrible user experience and didn’t fit the otherwise seamless flow of iOS. As so often is the way, innovation and change was born out of necessity with Notification Center being developed to rectify the problems created by the previous system. Since the launch of iOS 5 we have already seen an influx of tweaks and widgets created by the jailbreak development commusnity which hook into the new Notification Center to make certain tasks easier. These tweaks have included mimicking the functionality of SBSettings, adding RSS feeds, integrating social media timelines, displaying powerful media player controls and having the ability to quickly and efficiently show system preferences and statistics. Each one of these tweaks addresses a specific issue, and increases the performance of the native Notification Center. The latest released tweak designed for use within Notification Center addresses an issue which I am yet to see covered with an iOS 5 tweak. 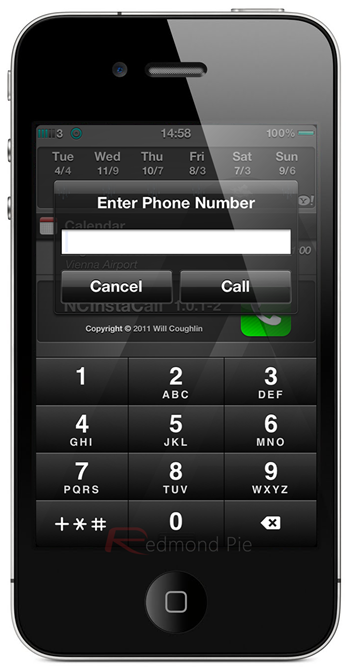 14 year old developer Will Coughlin from Alabama has provided the community with a free of charge tweak called NCInstaCall which allows device owners to make a quick telephone call to a user specified number from within Notification Center. NCInstaCall has no Springboard icons and is classified as an add on which can be enabled or disabled via the notifications section of the devices default Settings app. The tweak shows an enterprising nature from the teenage developer who has addressed an issue which had yet to be covered. It is also a very professional looking implementation which does not look out of place on a non themed iOS device. NCInstaCall is available now through the Big Boss repository free of charge.